I was awake because a little girl snuck in my bedroom, gently put her arm across my chest and her head next to mine, and said "I love you, Mama". The sun was up. The kids were watching cartoons. There was the smell of fresh coffee and french toast coming from the kitchen. 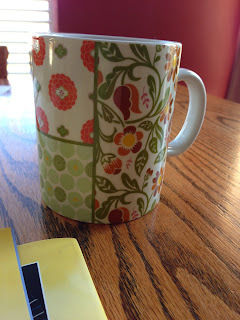 I sat at the table and sipped coffee from my favorite new mug, given to me by a sweet friend for my 40th birthday. I felt the warmth of the cup in my weak morning hands and I smelled the steam coming from the brew. I was awake. Awake and alive. Not long after breakfast, we decided to take a family walk. The kids got on their bikes and Luke and I walked. Thomas reveled in his ability to go "super fast", but still stopped once a block to stomp in the crunchy leaves or pick a lingering dandelion. I enjoyed every moment. 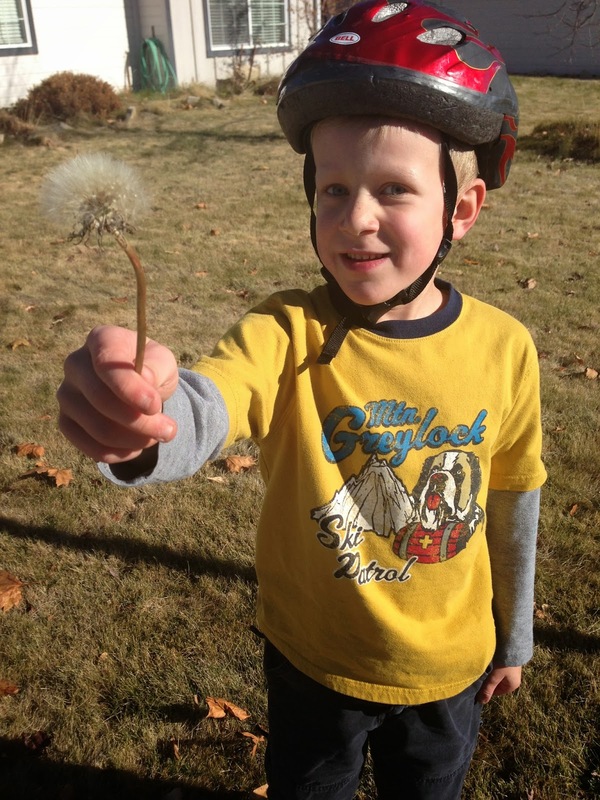 We made a wish and blew the dandelion together. I just had to take a detour to photograph these beautiful fall....berries? cherries? 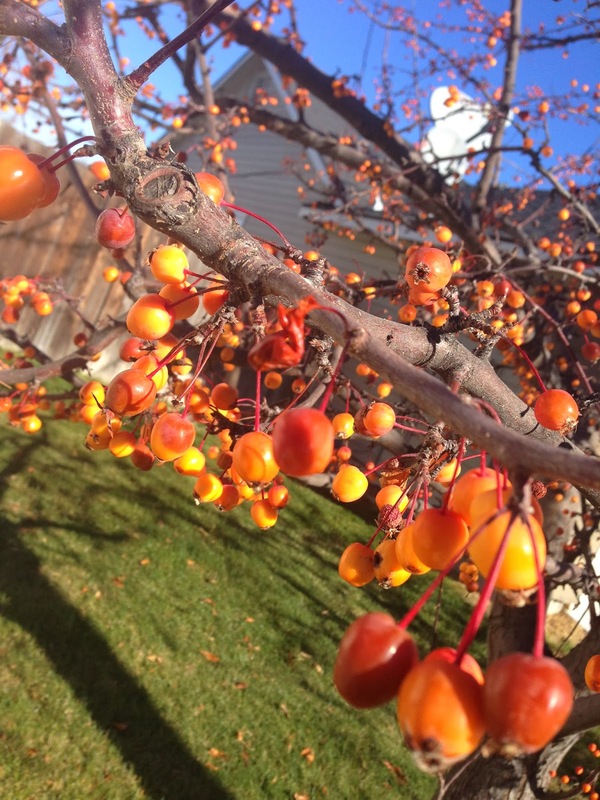 They glowed with the joy of fall and crisp air. I felt like I was moving in slow motion. 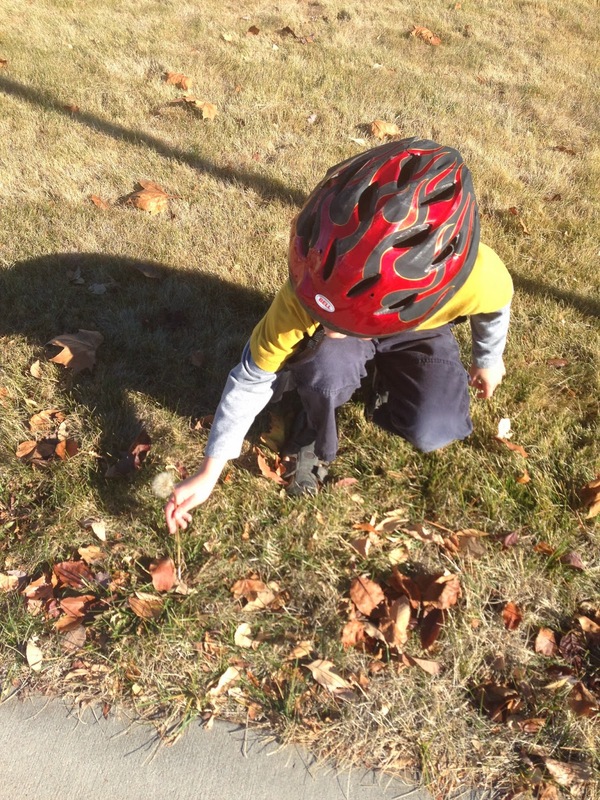 The green grass....the blue sky...the smell of leaves....the red skin on my cold hands. At one point, Thomas came running up to me and said "Mama! Did you see? I was going SO fast!" Then he ripped open his coat and said, "wanna feel my heart? It's boomin' SO loud!" YES. YES, I REALLY WANT TO FEEL THE POUNDING OF YOUR HEART. I looked in his eyes as I felt his strong and joyful heart beating away under my hand. "Thomas, you are so strong and good! I love you very much!" He replied with that wide-eyed smile and dashed off to find his bike. Yes, I want to feel your heart. I want to feel the pounding of MY heart. I want to hug and inhale the scent of my love. I want to crunch the leaves. I want to knead the bread and wipe the extra flour from my hands as I enjoy the smell of sourdough. I want to chop the onion and fry the meat. I want to season the pot of simmering tomatoes and run the noodle dough through the press. I want to feel how my whole body cools as I clip my hair up off my neck. I want to nibble the extra crumbs of cheese left over from assembling the lasagna. I want to feel the little girl silky hair under my hand. I want to admire the dimpled chin of my handsome oldest child and the wide eyed smile of my youngest. I want to feel the rhythm of the music down to my bones. I want to feel the heat of the fire on my shins and enjoy the smiles and giggles of my children as they munch their toasted marshmallows. I want to take long walks while we talk about our dreams for the future. I want to feel his hand in mine and see the tender green-eyed smile of my forever love. I want to enjoy the relaxing soft glow of candles on the mantle. I want to sit on the front stoop and watch the sun set. I want to lay my head on my pillow at night and feel the silence and rest and safety of my house settle in around me. I want to open my eyes countless more times to a little girl's arm across my chest and a gentle "I love you" whispered in my ear. I really really REALLY want to live. And right now, that's exactly what I'm doing. I'm awake and alive and my senses are on fire with all there is to soak in. News that I have a brain aneurysm wasn't exactly on my "wish list" for a birthday gift. But today? It feels a whole lot like it's the best gift I've ever been given.